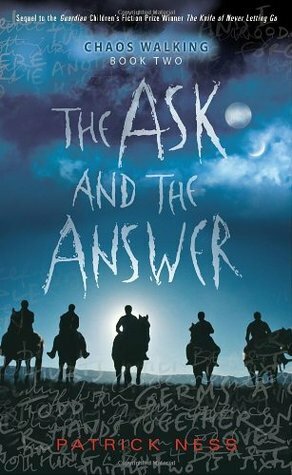 I started reading the first book of the Chaos Walking trilogy during May of 2012 and finished the third book just two months ago. That's quite a long time for a series that's fast-paced, thrilling, hard-to-put-down and having pretty good themes. The long time spent with the series probably is because although the books were intriguing, they were really long and I felt the need for a break after finishing each book. The Chaos Walking trilogy books are about a bunch of settlers in a new planet, where every man's private thoughts are not private - anyone can listen to what's going on in his head or rather to his Noise. Women, however, seem to not be afflicted by this strange problem. Their thoughts remain private, leading to much cause for anger among the men and riots between the men and women. Societies emerge where women are banished or killed and some, where men and women learn to live with the problem without fighting. I found it curious that the author chose to make the thoughts of only men public. I can't imagine living in a world where everything you think is "published" in the open. It's like tweeting every thing you think. Clearly, that will either make you a very horrible person or a very nice one, depending on what your twitter thoughts feed looked like. As the reader, we get a good insight into the minds of all men - some have learned to not think too much, causing them to appear "simple", whereas others didn't care what the listeners thought - they happily thought up violent images and plans. There is a lot that happens in this book but the underlying theme is that too much information is bad for anyone, and it is always advisable to control that. Not that the citizens of this strange world have that option. The Interweb likes to state that privacy is protected and publishing personal info is a personal choice. And although it starts from there, eventually, any word printed in the web is up for grabs by anyone with a little hacking knowledge. In the New World of the Chaos Trilogy books, there is no option of privacy at all for the men, and that makes them cranky. Funnily, when a cure for all that public noise comes along, the women (and some men) don't really like it. Understandably, because the people with the cure are the bad guys of the series. Still I wished the silence of the noise was welcomed and not received with caution and suspicion. The Chaos Walking books primarily follow two characters - Todd and Viola, who start of as hesitant acquaintances and eventually become very close. Through certain circumstances, they have both been catapulted to positions of importance within the warring communities. Their opinions seem to matter a lot among the adults (a persisting thread I found very unbelievable and probably the only aspect of the book that annoyed me). 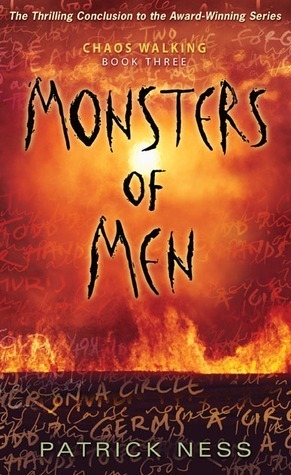 Each of the books focus primarily on a different population - the first (The Knife of Never Letting Go) on the men, the second (The Ask and the Answer) on the women, and the third (Monsters of Men) on the local people called the Spackle. And that's where another element of the book comes in - how the invaders (the men & women) live with the natives (the Spackle). The Spackle are always tramped upon and taken as prisoners, oftentimes subject to inhuman treatment and cruelty. The third book tries to find a balance among these peoples that none of them want to yield to. There are three other short stories in this trilogy that are available for free to read. 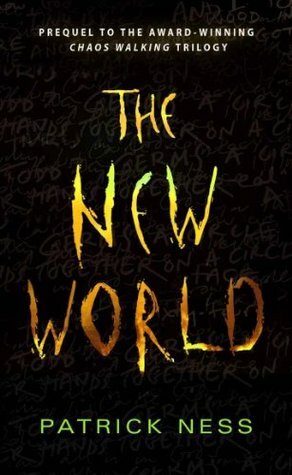 I've only read the first one - The New World, which is set in the time period before the first book. 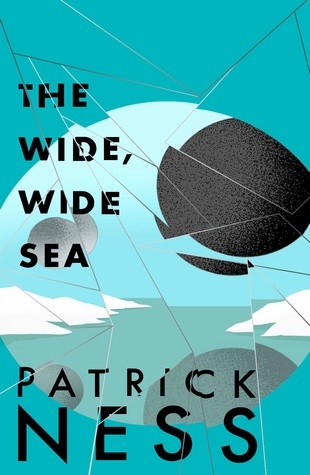 I enjoyed this short 24-page book a lot more than I expected to but wasn't aware of the other two (The Wide, Wide Sea and Snowscape) until I started writing this review. I'm looking forward to reading them next. These books are from my personal library. 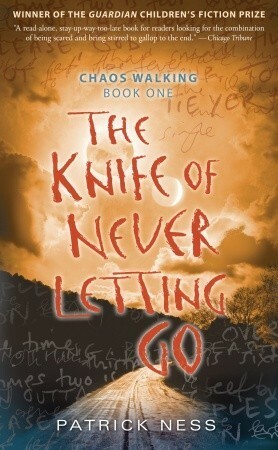 I have The Knife of Never Letting Go but I haven't read it yet. I really have a hard time tackling book series. The only series I finished was The Hunger Games and I plan to start reading one book from 5 different book series this year. I have had my eye on these for an age and I own the first in the series. 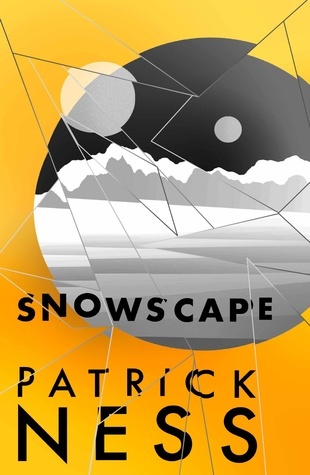 Patrick Ness has never let me down so I am really looking forward to reading the trilogy this year. This plot had the potential to become very gimmicky, but everyone tells me it's not. Did you also feel that? I've seen lots of good reviews of this series and after reading your review, I'm pretty sure I'd enjoy it. I'm glad that it didn't feel gimmicky while you were reading. Have you read A Monster Calls? I love these books so much. I can't imagine reading them all at once though: When I read The Knife of Never Letting Go, The Ask and the Answer wasn't even out yet (or maybe it was, and my library just didn't have it?). I had to wait! They'd be very very intense to read three all in a row. Not yet! I have it on my wishlist and hope to get to it sometime soon. I pretty much read these books months apart and I agree with you - that helps in digesting the concepts of the books better. Not that it was deep but it did have a good chunk going on.